The great thing about a city like Tokyo is that you never run out of things to see. After a brief Tokyo rut, we’ve recommitted ourselves to crossing things off the “to-see” list. 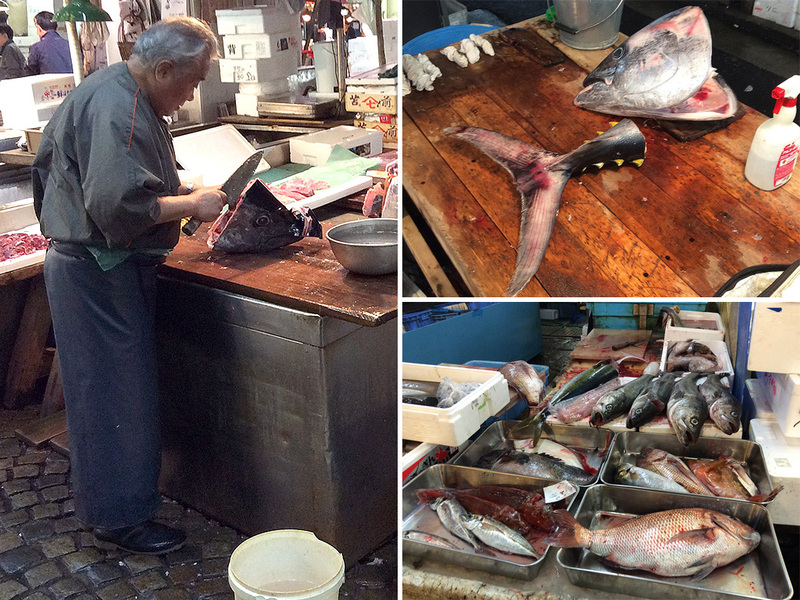 First item off the list was the historic Tsukiji Fish Market in Tokyo’s Chūō Ward. 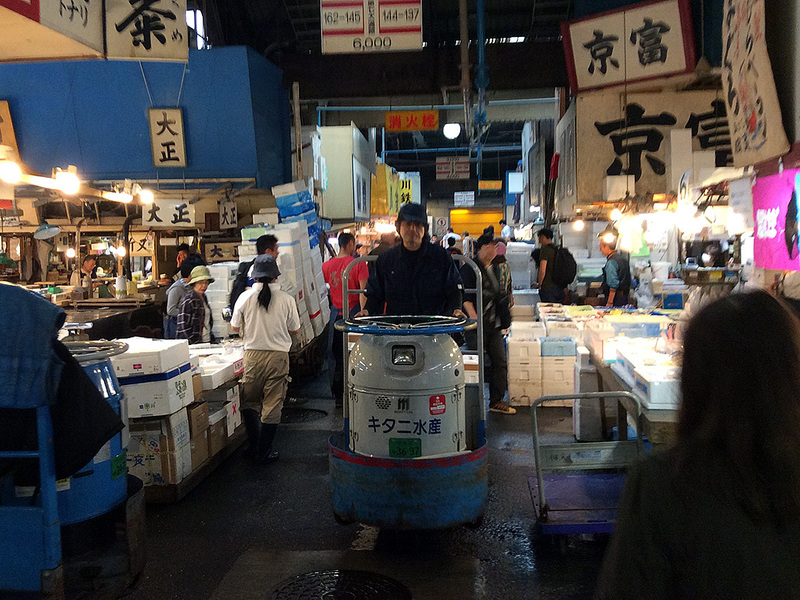 Tsukiji is a popular tourist spot, but it’s also a working wholesale fish market. Visitors rub elbows with local chefs picking through the freshest (in many cases, still alive) seafood in Tokyo. Inside, hundreds of vendors crowd into a warehouse. The smell of the sea greets you from a block away. The aisles are narrow with just enough room for one-and-a-half people to pass through. Tourists alternate between snapping photos, sidestepping fish-water puddles and dodging the turret trucks that zip down the aisles. Old-school wooden carts roll through more slowly, loaded with some of the larger ocean fish and offering a hint at the origins of the market. Catch of the day… it looks like I’m afraid someone’s going to steal my fish! Fish markets in Tokyo date back to the 1600s, but the current incarnation was built in 1935 after its Nihonbashi district predecessor was destroyed in the Great Kantō earthquake in 1923. In November 2016, the market will be moved to nearby Toyosu to free up the current location for development prior to the 2020 Tokyo Olympics. 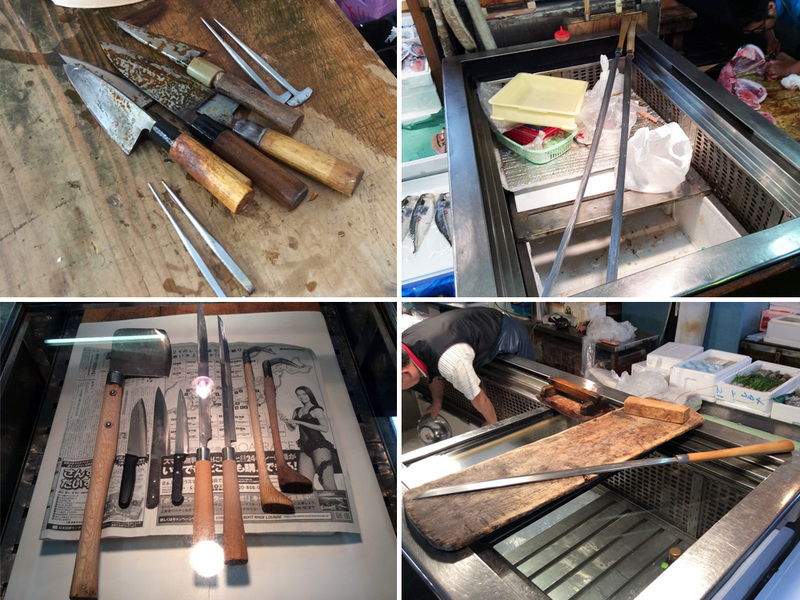 The tools of the trade at Tokyo’s Tsukiji Fish Market. The butchers worked with surgical precision, carving the large fish into perfectly-weighted fillets and making paper-thin slices for sashimi (raw fish). Many used “knives” that more closely resemble a samurai sword than anything you or I have in our kitchens. 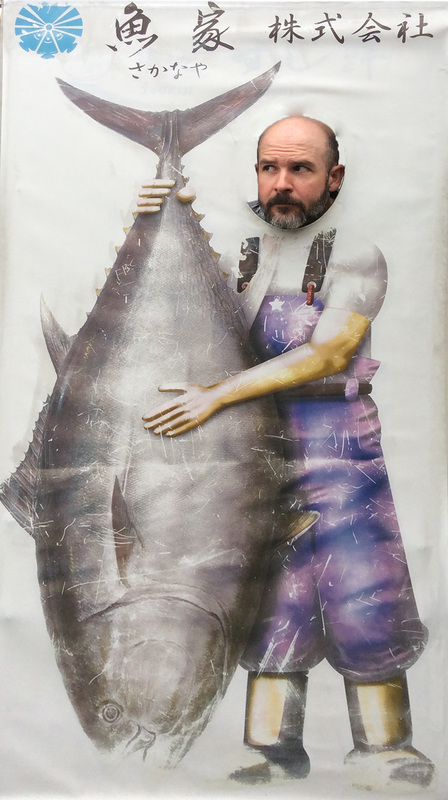 The four-foot long blades made short work of the even the largest tuna. The surgeon vs. the sturgeon. Did I mention this was a working fish market? 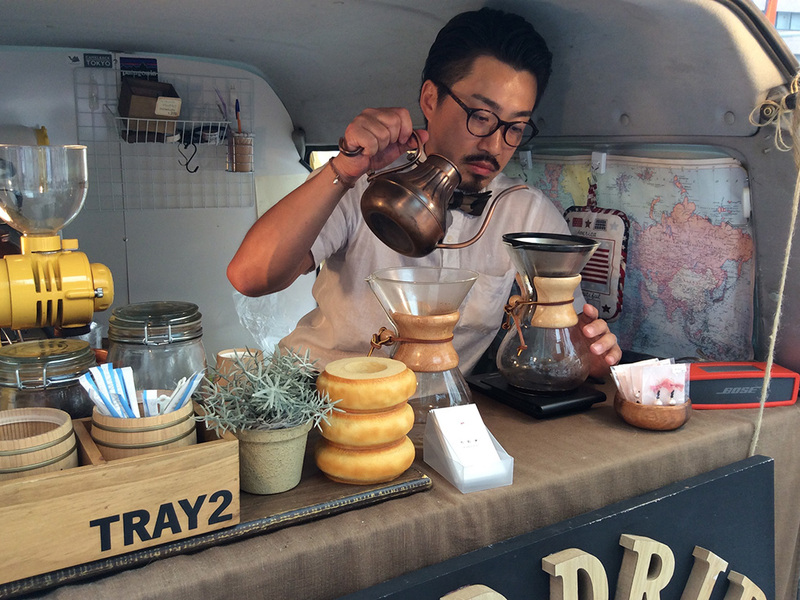 After awhile, the aromas inherent in such a place started to take their toll on our stomachs. Occasionally I’ll come across Japanese food that makes me second-guess my vegetarian choices, but the fish market was not one of those places. 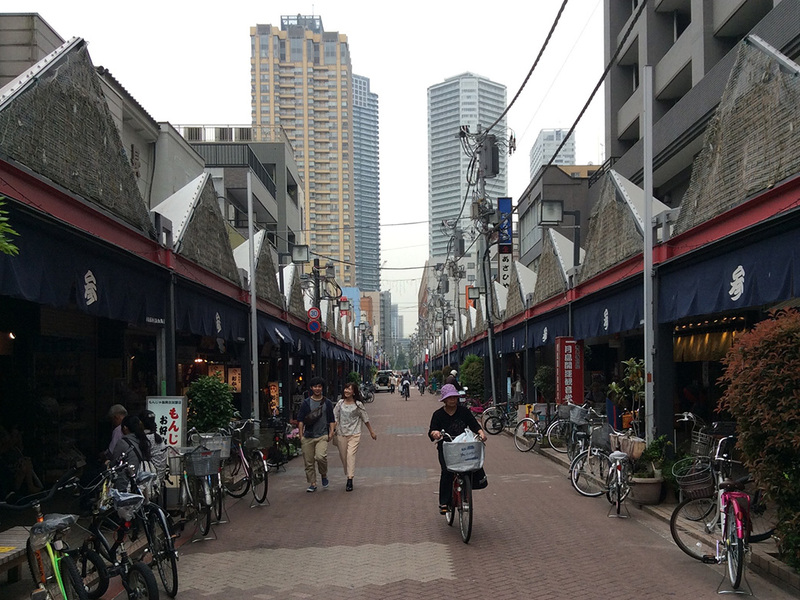 We headed outside for some fresh air and a short walk over the Kachidoki Bridge to our very favorite farmers market in Japan. Market of the Sun is Japan’s largest regular farmers market and has the most unique selection of local produce, goods and snacks in Tokyo. We left with a couple varieties of honest-to-goodness rye bread and a hearty beet, both nearly impossible to find in our local area. Looking down Monja Street on a quiet Saturday morning. A couple blocks away from the market, we checked off another of our Tokyo to-dos with a visit to Monja Street. We’d first tried monjayaki during my birthday weekend in Asakusa. This two-block stretch of restaurants in the Tsukishima district features almost exclusively monjayaki and okonomiyaki shops. Although it was proper lunchtime, most of the shops were still closed when we arrived. We found one with several people inside and ordered a monjayaki and an okonomiyaki—best described as savory Japanese-style pancakes. The waiter started our monja on the table-top grill, but we took care of the okonomiyaki ourselves. Check out the video below to see us in action!